Hartlepool United have signed Scunthorpe United defender Andrew Boyce on a month-long loan deal. Boyce made 34 appearances for the Iron last season after a loan spell at Grimsby but has yet to feature during the 2015-16 campaign. The 25-year-old started his career at Gainsborough Trinity and has also played for Lincoln. "He's big and strong, he's a leader and he suits what we are looking for," Pools boss Ronnie Moore told BBC Tees. 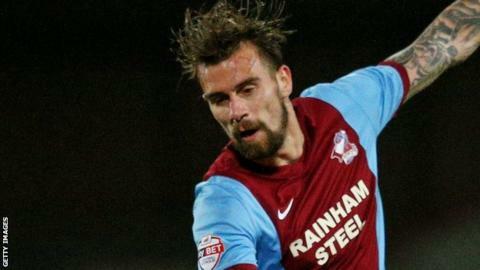 Boyce helped the Iron avoid relegation from League One last season and Moore believes his experience will aid Hartlepool's defence. "He played an awful lot of games last year for Scunthorpe and he's tall, which helps at this level," said Moore.